Let me start out by saying that I think I have been living on another planet. 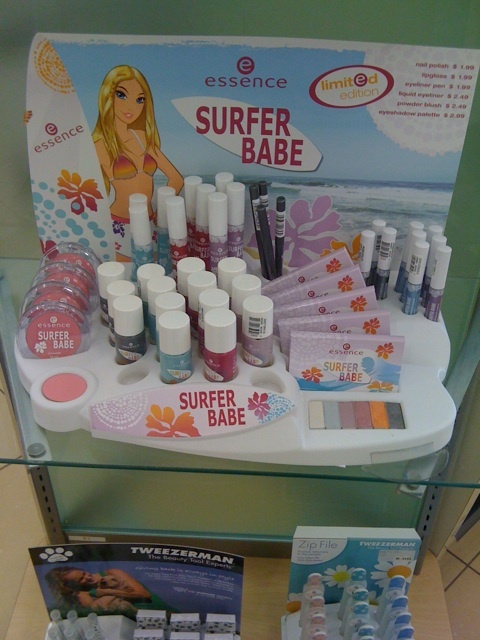 I had NO idea Ulta carried Essence. I rarely venture to Ulta because it's out of the way for me in part of town that is always backed up in traffic, but my recent trip to Ulta may have made me consider going there more often. They had this incredibly cute collection there called "Surfer Babe"
The collection consisted of blush, lipglosses, eyeliners, eyeshadow palette, and nail polishes! I only ended up getting 2 polishes from the collection because I am an idiot. I should of got them all. The only reason I didn't was because I felt 2 of the colors were pretty standard and unoriginal, but in hindsight the collection is super cute and the whole set would of been nice. OH WELL! :P I may go back and get the other 2 since they were only $2 each. Hang Loose is a pale lavender creme. It's a very sweet and pretty color, but it doesn't scream girly to me. It seems very chic. The other two colors which I can't recall the names of were a magenta color and turquoise blue. I know I passed up on a turquoise blue. It looked very similar to a Essie Turquoise & Caicos or China Glaze For Audrey color that I didn't feel I really needed. Again, looking back now I wish I got all of them just for the look of the bottles and the collection. Oy. I'm annoyed with my self, but I'm glad I did get some stuff from this collection! Ok, I'm going to end this self-deprecating post now. oOOH! I can't wait till my ULTA gets this! Booo!! NM is one of the few states that doesn't have an Ulta (though that's probably not a bad thing). Great collection! These swatches are great, the colors are soooo cute and chic! I realllllly hope my Ulta still has these!! Wow you can't beat $2! I'm making my Ulta trip today or tomorrow, I'm kinda scared LOL. Hang loose is pretty. What?? I wonder if the Ulta close to me sells Essence? I don't go to Ulta because the closest one to me is over an hour away. I think these just recently showed up in Ulta, at least mine. I got them all the other day to send to a friend they are cute. Do you think Hang Loose is similar to China Glaze - Light As Air? I just saw these at Ulta yesterday too! Deanna- I freaked out too! I had no idea I could ever find these in the states! Jana- I don't have ChG Light As Air, but from swathes I've seen of it they look similar. I think Hang Loose maybe slightly more on the pink side. I'm not 100% sure though. ShortandSweet- That's a great idea. I think I'm going to go back and get the rest.